South Padre Island and its surrounding communities offer a variety of parks, museums and other attractions for visitors and residents alike. No doubt about it, the beach is the big attraction here, but some days the weather is not conducive to beach activities. On this page you will find links to sites featuring various area attractions. 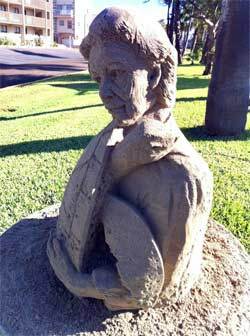 See amazing sand sculpture created by master sculptors -- 365 days a year! The University of Texas - Pan American Coastal Studies Lab, located on South Padre Island, Texas near the mouth of the Rio Grande, serves the missions of university education, coastal research, and public service/public education. So area.html uth Padre Island's water park is a big hit with visitors and residents alike! Want to see what is going on right here right now? spi-cam.com is our own mobile web-cam - you just never know what you might find it pointed at: sunrise over the island from Fred's house on the bay; sandy feet's backyard sandbox, or maypbe a special Island event. This baby really gets around! The homepage of the only area library - offering public internet access (if you have a library card! Texas' lower Rio Grande Valley overflows with history, romance, legends, and stories. The bustling newness of our rapidly growing economy is tempered by the Old World charm of Mexico’s rich history and laid back attitude. Assisting filmmakers with information on locations, laws, crew, talent, weather, and accommodations, South Texas Film is dedicated to translating your vision into a workable reality. Harlingen, Tropical Playground of Texas! Harlingen is a semi-tropical dream come true for sports enthusiasts, history buffs and serious shoppers. Because of the moderate year-round temperatures, outdoor activities such as golf, tennis and softball can be enjoyed virtually all year-round.. The Port Isabel, Texas Chamber of Commerce offers Rio Grande Valley history on the border with Mexico, on the Laguna Madre (bay), at the tropical tip of Texas and the Gulf of Mexico. Anyone who ever attended Pharr/San Juan/Alamo schools will want to take a look at this site. Find out all the latest on reunions and what your former classmates are up to these days. Rio Grande Valley, Texas is a general information site for the Rio Grande Valley Texas. Monterrey, Nuevo Leon, Mexico located about 2hrs from the Texas Border. The site has general tourist information about the city.. museums, movies, theaters, bars, business, night clubs, restaurants, photographs, maps, events, employment, universities, consulates, help, sports, etc. MUSEUMS of Port Isabel is a complex consisting of three diverse facilities, the Port Isabel Historic Museum , the Treasures of the Gulf Museum , and the Point Isabel Lighthouse. All three are within walking distance of each other and are open year around to the public. A used bookstore, gourmet coffee pub, and haven for local treasure hunters, amateur historians, and artists of all kinds. Read recent columns by local treasure-hunter Steve Hathcock, who also is a licensed massage therapist -- lots of good stuff here! This page contains most of the Museums around the Valley. It contains some information about each museum, its location and phone number. I hope this page can be of aid to you.